Howdy guys my girlfriend bought me a zelkova elm bonsai for valentines day this year. Its been fine ever since, I've been watering it when it needed watering and feeding with feed once a month (as it was the winter) but now as spring starts to set in my little bonsai has started to loose all of its leaves and I've changed nothing. i fear it may be too late to save it but any help or suggestions will be appreciated. p.s. I keep my bonsai indoors. Posting a picture would be helpful so we can get more of a look of what's going on. And in other posts, some people have mistaken Zelkova for Chinese Elms. Justin is right. Pics would help. But consider this. Elms are deciduous trees which do drop leaves. It is a natural thing. While the leaves are off the tree less water is needed, but I don't mean 'bone dry' either. The soil should be moistened good but not soggy wet, and should dry some between waterings. Refer to the 'chopstick method', like a dip stick to check moisture level in your soil. New buds should appear soon. As they swell and pop they will need more water, more sun, more fert. Don't fertilize in winter. Don't fertilize when the tree has no leaves. Do it in the growing season. I think your little tree has just passed through a short dormancy period/seasonal change and (hopefully) it will come roaring back. Meanwhile - don't give up hope - read all you can about basic bonsai culture. Learn all you can about elms/Zelkova. They are fascinating. Impress your girlfriend !! 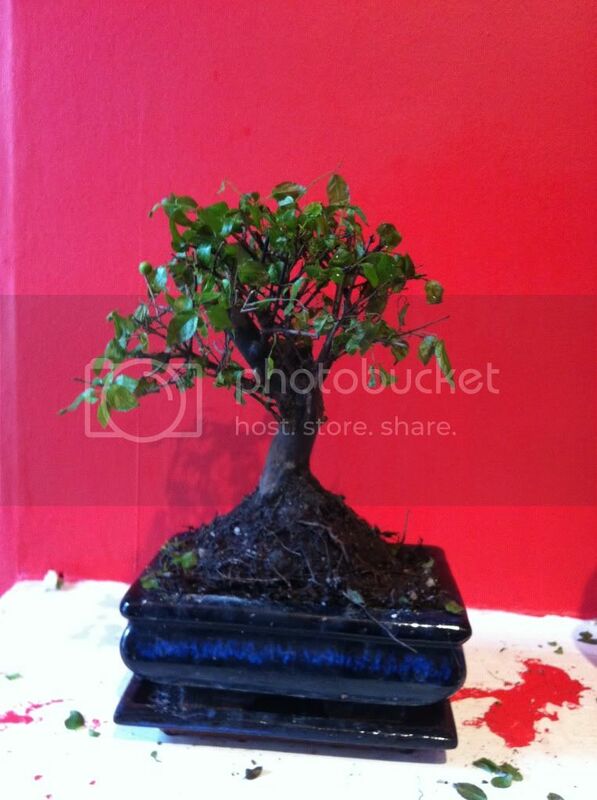 Get her a nice little ficus or azalea bonsai - don't wait for her birthday!!! Thanks guys i think you may be right as with a closer look there is a few buds on my tree. however here is a photo anyway so you can have a look. I think your little tree might be rootbound. But first things first. Get it stablized and growing good. Then consider a re-pot, trimming back the root ball and fresh bonsai (fast draining) soil.